A win for Apple but for how long? Apple has won a ban on sales of the Samsung Galaxy Tab 10.1 in the US while a court looks into its claims of patent infringement. The ban is not permanent, but is could potentially stay in place unless Samsung wins favour in the trial which is set to begin on July 30 – however, Samsung has been quick to enter an appeal against the decision. Judge Lucy Koh surprised everyone by granting the preliminary injunction, explaining, "Although Samsung has a right to compete, it does not have a right to compete unfairly, by flooding the market with infringing products." 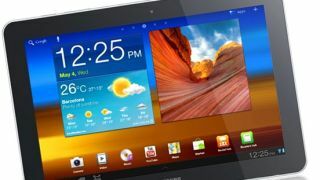 Apple alleges that Samsung's Galaxy Tab 10.1 design infringes on the look and styling of the iPad and iPad 2. But all is not lost for American Galaxy Tab fans; the ban applies only to the original Samsung Galaxy Tab 10.1 and not the newer iteration, known as the Samsung Galaxy Tab 2 10.1. There are very few differences between the two versions of the tablet though – the Tab 2 10.1 was swiftly developed to avoid exactly such bans (like the one in Germany). As patent expert Florian Mueller explains, "The scope of a design patent is relatively narrow… so Samsung can design around it." As such, the bezel is slightly different plus the tablet is a little thicker and a little fatter than the original 10.1-inch slate.